The elusive low in the bay is increasing the monsoon deficit by the day. As on the 5th. it was -26%, and remember, anything over -10% is serious matter ! If we recall the last 2 drought like conditions in the previous years in this decade the monsoon was -19% in 2002 and -13% in 2004. Lets analyse and see the prospects of happenings in the next 2/3 days. 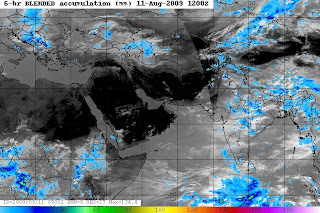 Today, the low "aloft" mentioned in the previous blog, has moved westwards, and as we discussed, precipitatating some rain along the central regions of India.Not much to write about really ! (map of todays actual rain is atttached). International models indicate the fizzling out of this system "aloft" within a day. The expected arrival of MJO wave may once again start rains (after the 20th. 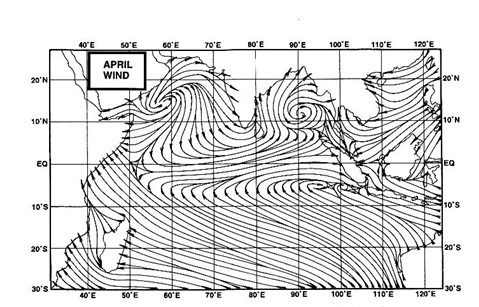 ), and precipitations will start from the origin of the MJO, that is Kerala/Karnataka coast. But previous instances show, that at the rate of the present pace of development, and the time lags in the initial time of development, the MJO will be fully operational on the South Indian coasts (and then onwards inland), not before 20th. August and could last as a wave for arou nd 15 days, on an average. .
Today the monsoon trough passes through Firozpur, Meerut, Kanpur, Daltengunj,Jamshedpur, Digha and thence southeastwards to eastcentral Bay of Bengal, slightsouthward compared to yesterday. According to the IMD, It is likely to shift further southwards during 48hrs. Now, the dissapointing story ! The IMD has degraded the low expected in the bay to the expected formation of a circulation / weak low pressure l during next 1/2 days from the 11th. Model predictions suggest that under the combined influence of southward shift of monsoon and the circulation, monsoon is likely to improve over the country. But a circulation is not a low, it is weaker, and 1 notch lower. Hence, after the moving away/fizzling out of the on-going low "aloft" (the one discussed above), a sort of lull can be expected again, at least till the weak circulation forms in the bay. Though, i personally do not expect much from this formation in the bay. We may have to wait for another 8 days to see something "happening " from the MJO. Rains will be subdued for this week mostly all over, except the eastern states. Mumbai, scanty rains,in different parts, not more than 5 mms per day, and again hot (it is now 32c ), for the next 2 days. No real "monsoon" rains for another 2 days, at least.